Charleston, in East Sussex was the bucolic getaway of the Bloomsbury Group. 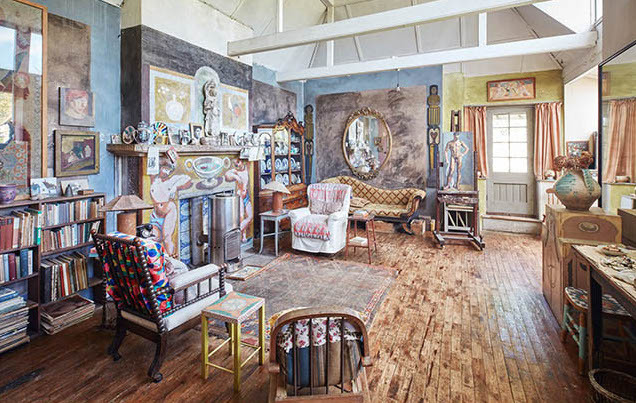 The farmhouse was owned by Vanessa Bell and Duncan Grant and was a hotbed of creativity activity. House & Garden writes that, “almost as soon as Vanessa and Duncan moved into Charleston, they began to paint, not just on canvas, but over every available surface – walls, of course, but also tables, chairs, bedheads and bookcases; all glowed with swirls and spirals of colour and pattern, full of life and vitality, that was as far from the conservative, conventional interior decoration of the time as it was possible to be.” It’s now a museum, and one I’d love to visit. Just look those two flamboyant caryatids painted by Duncan Grant on the mantle piece in the studio. And what about the colouful tub in that green bathroom, or the kitchen cupboards painted by Vanessa Bell. Who needs a canvas when you’ve got walls! And if they talked; gosh, the stories they’d tell.